Students walking on the University of South Dakota campus. As heartland communities go, the city of Vermillion, nestled in the southeastern corner of South Dakota, is perhaps typical. Sitting atop a bluff near the Missouri River, with leading industries based around corn, soybeans and alfalfa production, it’s home to a bustling State Fair every summer as well as a Walmart on Princeton Avenue. What’s less typical is that it’s also home to the state’s flagship liberal arts college. 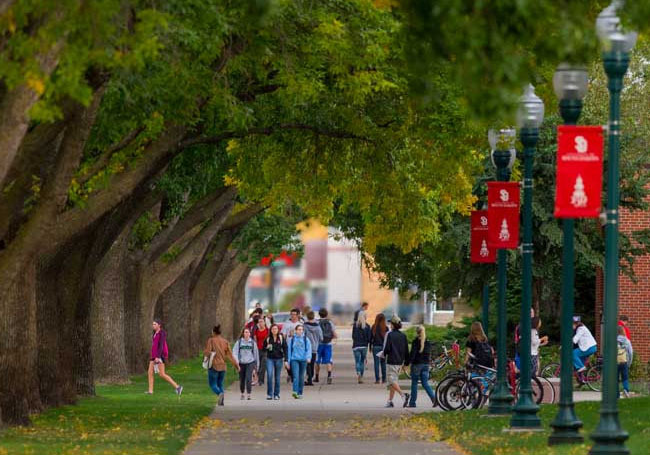 “One could say our campus of 10,500 makes Vermillion one of the largest cities in South Dakota,” quips John Howe, Associate Dean of Students at the University of South Dakota. Attracting students from South Dakota, Nebraska, Iowa and neighboring states, the University of South Dakota (USD) campus and its students are a very important part of this Midwestern community. Even as college demographics embrace a wider span of “non-traditional” students, those from rural areas are still underrepresented in the overall national student body. Just 29 percent of rural students are enrolled in college, compared to 47 percent of their urban peers. Yet the opportunity college offers can be even more significant in the heartland, where, far from representing a ticket out of their small-towns, many students are looking at higher education as an opportunity to make a positive impact on their own hometown communities. “It’s true that many USD students will find that employment, and their lives, might eventually exist outside the state,” Howe concedes, “but we have some robust internship programs here, and many students want to take what they’ve learned and use it to make a difference in their own communities,” he says. One state over, Josie Gillis, Store Manager at Iowa’s Clinton Community College (CCC) agrees. “We draw a lot of students from smaller communities around Iowa, and the majority are non-traditional, who have been in the workforce and are looking for retraining,” she says, pointing to continuing education programs from locally represented firms such as John Deere, IBSCO and ADM. Another large population at CCC are high school students looking to benefit from a college education. “I think parents are particularly pushing that. They want different skills and better job prospects for their children, and that’s reflected in the attitude of our students here — they want to be done with their schooling early and get into their professions,” Gillis says. The Maquoketa Center, an extension to the CCC campus, is an example of the ways the college is reaching out by offering new skills to a previously under-served rural area with an emphasis on employability. Many rural students are looking at higher education as an opportunity to make a positive impact on their own hometown communities. Arriving on campus from smaller communities, students can experience culture shock attending classes that are sometimes larger than their entire high school student body. It can be easy to become lost in a sea of faces. At the USD Bookstore, Manager Angela Miller says that because of the school’s hometown feel, the transition is somewhat easier. “They’re not nameless or faceless here. We’re interacting with students regularly, outside of the classroom, in restaurants, at one of our two grocery stores — they may even be our neighbors,” she says. While larger campuses might feel siloed and isolated within their own communities, students at USD seem to possess a stronger sense of community. “With 25 percent of our student population participating in Greek life, it’s a really collaborative campus,” Howe explains, citing charity events such as the Dakotathon dance party, which raised $140,000 for the Children’s Miracle Network Hospitals — not an insignificant amount for a small campus. Miller notes that the sense of belonging is reflected in the many volunteer hours students devote to the local community and the close bond that exists between the town and campus during home games, where the population can more than double. USD’s Howe says that the smaller, community-centered atmosphere of USD can provide advantages larger institutions might miss. “There are less distractions here, if you will, and it’s made it easier for us to learn how to develop diversity, for example, through the incorporation of a Native American Cultural Center, and that’s a community especially important to this state,” he says.